Heart is the muscular organ responsible for pumping blood throught the whole circulatory system and it is located in the middle compartment of he mediastinum, at the same time central compartment of the thoracic cavity. It's constant work of blood irrigation is executed in order to provide body cells with the oxygen and nutrients that they need to stay alive and operate, but also for assisting the removal of metabolic wastes produced by they themselves. 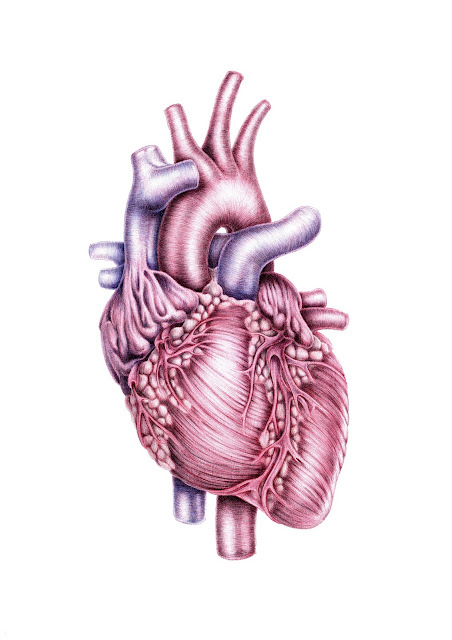 Not only in humans, but also in other mammals and birds, this organ is divided in four chambers as follow: upper left and right atria, and lower left and right ventricles. The blood low in oxygen enters into the right atrium throught the superior and inferior vena cavae, passing then to right ventricle and from here pumped into the pulmonary circulation for receive oxygen in the lungs. This oxygenated blood returns inside the heart throught the pulmonary veins into the left atrium, passing then to left ventricle, and pumped out again throught the aorta artery to the systemic circulation reaching finally the body cells.